For the new dedicated Alfreton site please click on the link below. Click on the link below to download a letter that you can edit and send. 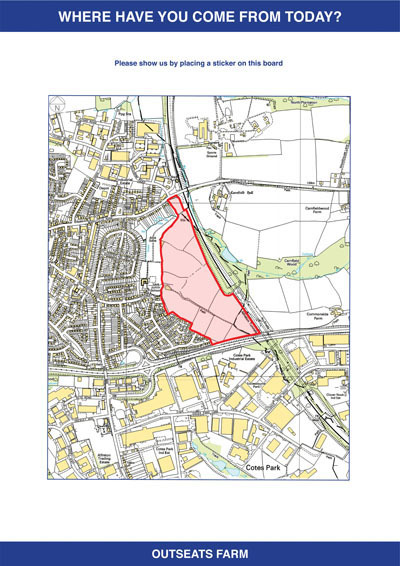 The documents posted on your website which relate to this planning application (for a proposed 500 plus new homes on a site acreage of 20.16 hectares of Greenfield land) use the draft National Planning Policy Framework, as a point of reference. The draft NPPF DOES NOT become a lawful document until April 2012, nonetheless, this objection also refers to the draft framework and other AVBC Local Plan policies. The aim of this document is to eliminate the principle of housing development on this site. 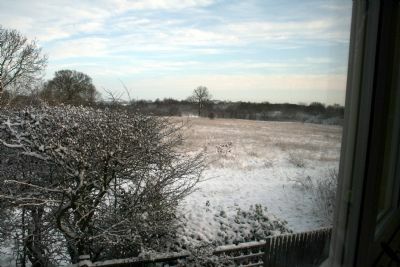 -the need for and benefits of the development clearly outweigh the loss.” There is a clear need for this open space to be retained, as it is NOT surplus to requirements, In fact, it can be argued that it is an essential requirement for the people of Alfreton, given the notable inequalities that the people in this area have to endure in terms of being able to access public open space. The developer clearly does NOT demonstrate the need to build on such a valued site! 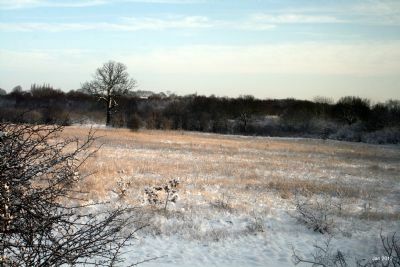 Finally, in this section, point 128 of the draft NPPF states that: “Planning policies should protect and enhance rights of way and access.” There are several public rights of way across the site, according to Derbyshire County Council, in a previous application for development that was refused, in respect of this site. This proposal, if it went ahead, would create an undesirable conglomeration in Alfreton and remove an important green wedge, where residents (who are already acknowledged as being ‘health deprived’) can exercise and use all of the amenities that this attractive and large area of open space provides. In effect, building on this ‘green lung’ will create URBAN SPRAWL. Surely, as point 109 of the draft NPPF states, AVBC should: “identify and bring back into use empty housing and buildings in line with their housing and empty home strategy and where appropriate, acquire properties under compulsory purchase powers.” According to AVBC’s ‘Area Profile for Alfreton, 2011’: “there are a total of 129 priority need housing register applicants in the last six years that have required housing in Alfreton. The majority of people have bid for one bedroomed ground floor flats followed by other one bedroomed properties.” This report goes on to add that there are 55 empty properties in Alfreton. These statistics illustrate that THERE IS NO OVERWHELMING DEMAND FOR FURTHER HOUSING GROWTH IN AND AROUND ALFRETON! In their ‘Statement of Community Involvement’, Capita Symonds say in point 4.9: “The housing market is depressed at present, however the development will be delivered over a period of around 10-15 years and it is considered that there will be a demand in this period. New housing can act as a catalyst to employment, providing decent homes for the workforce to encourage employers to locate in the area.” Can Capita Symonds see into the future and predict what our economy will be like in 10-15 years time? Their gross generalisation is just that-another means of re-inforcing their plans for development without factual evidence to support their claims! If the housing is to be delivered over 10-15 years, then why apply for outline planning permission at this precise moment in time? 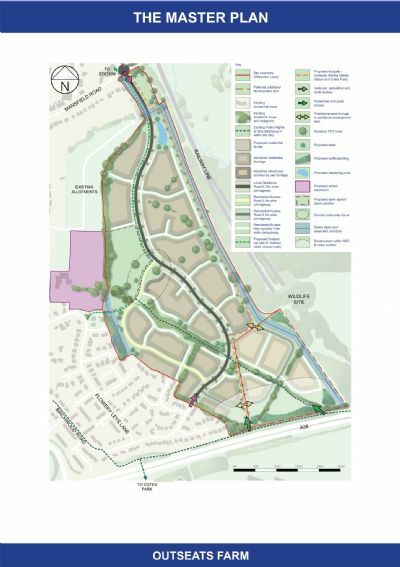 The ‘sceptics’ in the local community are tempted to believe that it seems to be the case that AVBC are encouraging developers to submit applications for large housing developments, such as this proposal, whilst the interim period between their new Core Strategy and the draft NPPF being amended, (prior to it becoming law in April 2012) is occurring. In other words, NOW, would seem to be the ideal time for AVBC and developers to ‘bulldoze’ planning proposals of this magnitude through. Let’s hope that AVBC will address this case on its merits (not that there seem to be any!) and constraints when reaching an accurate planning decision, rather than allowing housing targets to dictate the outcome of this application! As for the comment by Capita Symonds that new jobs can be created by new housing, any member of the community would find this comment difficult to digest, given the lack of job opportunities prevalent in Alfreton at present and no hope of this situation changing in the foreseeable future. AVBC ’Statement of Community Involvement, Adopted June 2006’ Point 7.8 “At pre-application stage, we will, for major developments, encourage applicants to hold exhibitions (in the plural) and other public events to seek clarification of community aspirations, recognising that there are various ‘communities’ which may be affected, possibly requiring separate approaches according to their interests.” ‘Planning Policy Statement (PPS1)-Delivering Sustainable Development’ This document contains the following quote: “local communities should be given the opportunity to participate fully in the process for drawing up specific plans or policies and TO BE CONSULTED ON PROPOSALS FOR DEVELOPMENT.” There is no doubt that the consultation process, given the scale and magnitude for this proposed development has been deeply FLAWED. There has been a Stakeholder and Community Workshop at Alfreton Grange Arts College on 19-7-2011 where 78 invitees were asked to attend. Only 14 of them were able to! Since then, the only interaction with the public has been at ONE 4 HOUR PUBLIC EXHIBITION on 22-11-11 (from 5p.m. until 9p.m) at the same venue. Capita Symonds claim to have sent out 1,279 leaflets to homes and businesses in the vicinity within the catchment area. They also claim that random telephone calls proved that all of the leaflets were delivered. However, a number of residents have stated that they knew nothing of the exhibition and that they did not receive a leaflet. Further to this, only 130 people attended the four hour exhibition! Residents feel that they have been discriminated against! Compared to residents in other parts of our borough, who appear in some instances to have had full weekends or even a full week to view plans, maps etc. related to development proposals and liaise with developer’s representatives, there is a general feeling that a four hour slot on just ONE particular night of the week has not given local residents sufficient opportunity to form opinions about this proposed development. It is also noted that notice of the planning application being submitted on 1-2-12, has been published in the Derby Telegraph (not our local newspaper, as Derby is 16 miles away), when many residents have not had the opportunity to comment on the plan! Thus, it is suggested to AVBC that this planning application is put on hold until further and ‘proper’ consultation between Capita Symonds and local residents has taken place. 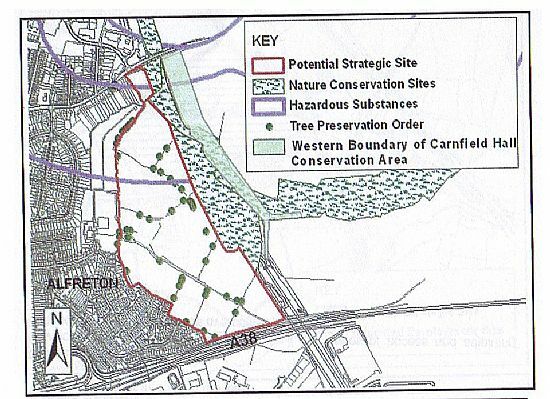 The site lies wholly within the settlement framework of Alfreton but also lies within the Health and Safety Executives Consultation Zone for Hazardous Substances. In the AVBC Local Plan 2006,Policy EN15 states that: “redevelopment of the site would involve to seek any hazardous or polluted ground conditions,” This is backed up by Planning Policy Statement 23, which AVBC, as the Local Planning Authority, must adhere to. The Hazardous Substances Authority (in this case, AVBC, who have their own ‘contamination officer’) must consult the National Health and Safety Executive (HSE) in respect of this planning application. The HSE will consider the hazards and risks, which the hazardous substances may present to people in the surrounding area and take account of potential development. It is noted that NO HSE report has been submitted for public inspection and comment. Furthermore, is it prudent to develop a site, part of which contains hazardous substances, which are not known to local residents? -there are 520 dwellings proposed. This will increase the volume of traffic by circa 1000-2000 vehicles entering and exiting the proposed new site. This ‘new’ traffic will impact on the existing road network in and around Alfreton. -vehicles from both the proposed site and Mansfield Road will probably use the Birchwood Estate as a short cut through to the A38, creating ‘gridlock’. -traffic entering or leaving Alfreton will ‘hit the existing bottleneck’ around GJ’s. -the traffic congestion that motorists currently endure in Alfreton will be significantly exacerbated by the traffic generated by the proposed development. -traffic approaching the Lidl roundabout via Nottingham Road and Mansfield Road is already ‘stacked up’ on a regular basis. -Alfreton Town F.C. home matches cause traffic chaos in Alfreton. -a shortage of car parking space already exists in the town. No plans have been forwarded to tackle this problem. -the town centre will LOSE business due to insufficient parking space. Therefore many people will travel out of the town to shop. The draft NPPF advocates the regeneration of town centres, not the depletion of town centres! Schools-Derbyshire County Council would have to be consulted regarding the capacity of schools to cope with increased pupil numbers in the area. There could be a possible influx of 600-700 children! Medical Provision-this is already poor in the Alfreton area (there is only one doctors practice in central Alfreton). How will residents in a ‘health deprived’ community like this be catered for? In addition, there is currently a 6-9 month waiting list for dental appointments! Crime-There are plans to close the police station. ”The level of crime in Alfreton is above the borough average: within a 12 month period (Aug. 2008-July 2009) the number of crimes committed per 1000 people was 115.1 compared to the borough average of 65.2 per 1000 people. It is ranked as the highest crime area in the borough” (AVBC Area Profile for Alfreton, 2011). This is EXTREMELY WORRYING! I sincerely hope that you understand the seriousness and complexity of some of these constraints to the proposed development that this letter raises. Furthermore, I also hope that these objections help AVBC’s Planning Board in making the decision to reject the proposed housing development at Outseats Farm, Alfreton. I would be grateful if you would acknowledge receipt of this objection, as soon as possible, either by e-mail or post. Many thanks.